This project was an aggregation and distribution project from a word document manuscript supplied by the author. We designed the cover using a sketch illustration of explorer Edmund Kennedy from the Wikimedia Commons. This job also included distribution to Apple and Amazon. Based on the true story of Edmund Kennedy’s ill-fated expedition to Cape York. 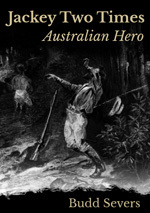 The heroic exploits of Kennedy’s friend, aboriginal guide Jackey Jackey.